The Black Bishop Euplectes gierowii is a relatively poorly known species, with scattered populations. It is the largest and least common of the red and black bishops (see also Southern Red Bishop E. orix, Black-winged Bishop E. hordeaceus and Zanzibar Bishop E. nigroventris). 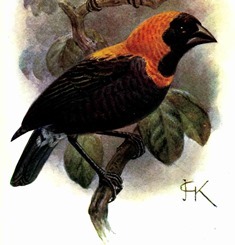 The breeding male is distinguished from the sympatric Black-winged Bishop by a mainly black head, orange-yellow back, and black rump; the orange breast-band width varies with race. The female and non-breeding male are blacker above than other bishops (especially male), heavily streaked, with a broad creamy supercilium - other bishop species are smaller, females paler, and not spotted below. E. g. ansorgei, or Northern Black Bishop, from Cameroon across to Ethiopia and western Kenya (see red on map). 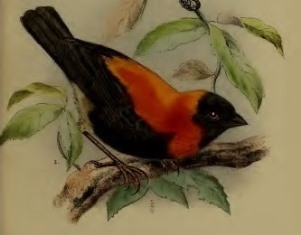 The breeding male of this subspecies has more extensive black on the crown and throat, a narrower orange collar on the upper breast, and the lowermost underparts are buff with broad dark streaks. 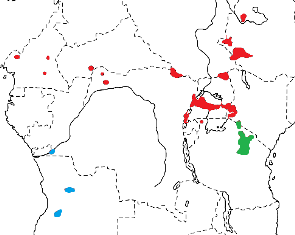 E. g. gierowii, Angola Black Bishop, in DRCongo and Angola (see blue on map). 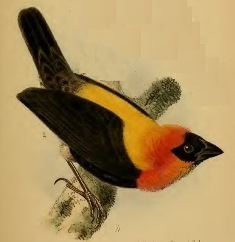 The male of this subspecies has the mantle yellow, not orange. E. g. friederichseni, or Southern Black Bishop, in southern Kenya and Tanzania (see green on map). The male male has the hindcrown and nape to back bright orange, rump buff with dark feather centres, a broad orange band around the breast, black lower breast and belly, buff thighs and undertail-coverts. In most parts of its range it is uncommon to rare. The subspecies may be emerging species. The Black Bishop inhabits tall grassland, in swampy or drier bushy areas, and also scrub and sugar cane. In Kenya it is found in areas with more than 1000 mm annual rainfall, whereas in Tanzania it occurs in drier country. It is often found with the Black-winged Bishop in East Africa. Its diet includes seeds and insects, the latter including winged ants and alate termites. It forages mainly in pairs and small groups, and joins mixed species flocks in the non-breeding season. The Black Bishop is polygynous, and the male holds a territory containing three or four nests. The nest is coarsely woven, with a large entrance high on one side. It is built with grass, and lined with grass seedheads. 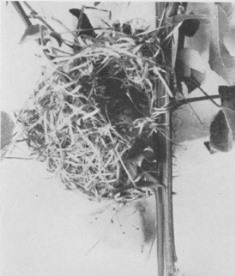 The nest is usually placed above the above ground in elephant grass, attached to one vertical stalk and some leaf blades, although one nest was in the fork of a shrub. The clutch is 2-4 eggs, and the eggs are bright blue, sometimes with fine black or red-brown spotting. Nothing else is known about its breeding habits. The Black Bishop has no PHOWN records but some breeding information is at this PHOWN summary. Submit any weaver nest records to PHOWN (PHOtos of Weaver Nests) via the Virtual Museum upload site.